After the sudden, violent and unexplained death of his grandfather Abe (Terence Stamp), teenager Jake (Asa Butterfield) and his father (Chris O’Dowd) go on a father-son bonding holiday to an island off the coast of Wales, where Abe lived as a young man. Abe had filled Jake’s head as a child with stories of the children with special powers who had lived in a home there, run by a mysterious woman named Miss Peregrine. Once there, Jake quickly discovers the home and finds Peregrine (Eva Green) and the children still there and very much as Abe had left them 70 years before. They do indeed have special powers and are stuck in a time ‘loop’, constantly re-starting to live in the past to escape the clutches of the cannibalistic ‘hollows’ monsters, lorded over by the insane Barron (Samuel L. Jackson). It’s up to Jack to help rid the children forever from Baron and his kind. Should Tim Burton hand in his clapperboard & retire? An extreme reaction for a critic perhaps, but I’ve been cogitating this since viewing his latest big-budget head to toe plunge into cinematic curiousness. Here Burton (the ‘Wizard of Odd’ according to Empire magazine) throws open the doors to his world of weird once again with a film adaptation of the book by Ransom Riggs, which contains elements of X-Men, Paranormal Activity and Looper in its alchemical cauldron of delight. These were films which cast a spell over and created an indelible impression on most impressionable pre-teens, but probably seem camp movie footnotes for anyone of that age now. Since the release of Big Fish (2003), more or less a catalogue of nonsense with no cohesive story to keep one interested, that tarnish has, successively, been rubbed off with each passing film. Burton, rather like Woody Allen, makes too many movies that are pale imitations of former glories. Sure, there is the occasional Sweeney Todd (2007), but more often than not there have been Alice In Wonderland (2010) or Dark Shadows (2012), films well received for their visual style and sound but not for much else. Miss Peregrine’s…falls into those films. 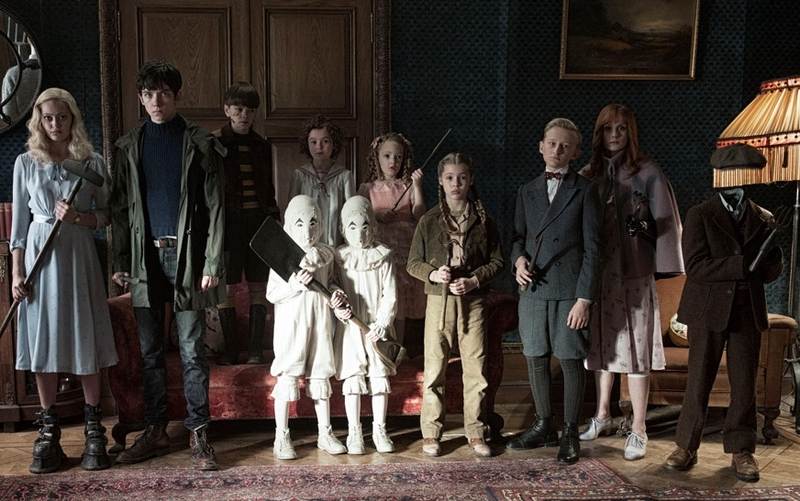 The peculiar children of Miss Peregrine’s home include Ella Purnell and Asa Butterfield (both far left). That’s not to say that this is a bad film; like a bad Almodovar movie, off-key Burton still proves watchable, if ultimately disappointing. The main trouble with his latest film is the same as that with the other ‘poorer’ films – too many unnecessary ideas, plot-lines, characters and ‘business’ for one film. Burton’s better films have less cluttered scripts letting him concentrate on the already strong elements of the story. Miss Peregrine’s…may have worked well on the page, but here it results in an over-stuffed film. From murder, ghosts, monsters, mutants, time travel, there are too many creepy elements trying to outdo the other. Dialogue describing umpteen characters’ back stories and the groups of people or monsters they belong to is gabbled out in rapid style, unintelligible to those uninitiated with the book, eventually (and sadly) becoming tiresome for the viewer. As with Alice In Wonderland, Burton films in 3D to no obvious effect, other than my being £1.60 out of pocket (cinemas charge more for 3D, you know). There is the odd stand-out moment, but otherwise, if you want to see this film, opt for the 2D version. 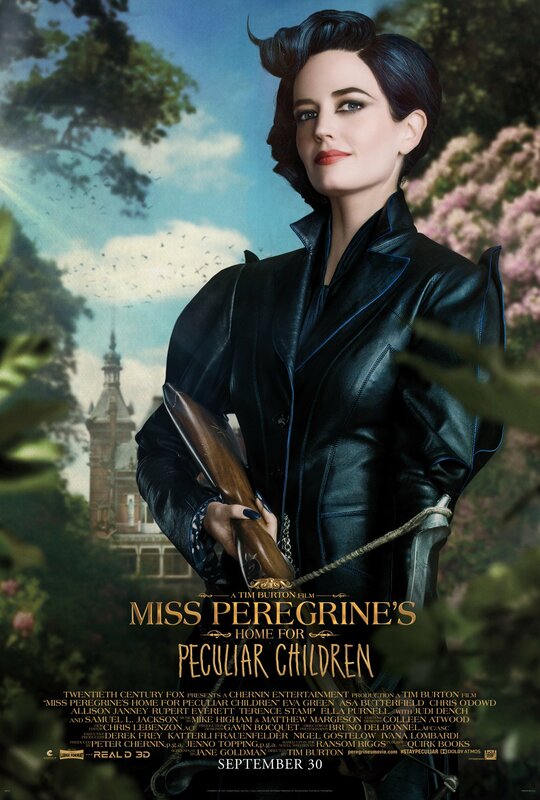 As already mentioned, the look of the film is vital to holding what interest is left and the design of Miss Peregrine’s is sensational to say the least. From a sunken ocean liner brought to life by a child’s breath, a dinner that includes layered carrot ‘cake’, to Green’s blue-black hair and exceptional make-up that accentuates her already huge almond eyes, no visual detail has been overlooked. In a Burton film, even Blackpool looks inviting in the winter. Jackson, with possibly the most uncomfortable looking dentures in film history since Lon Chaney donned dagger gnashers for London After Midnight (1927), seems not to enjoy the opportunity to ham it up as a comedy villain that much, so it’s up to the more spirited women to hit the acting home runs. 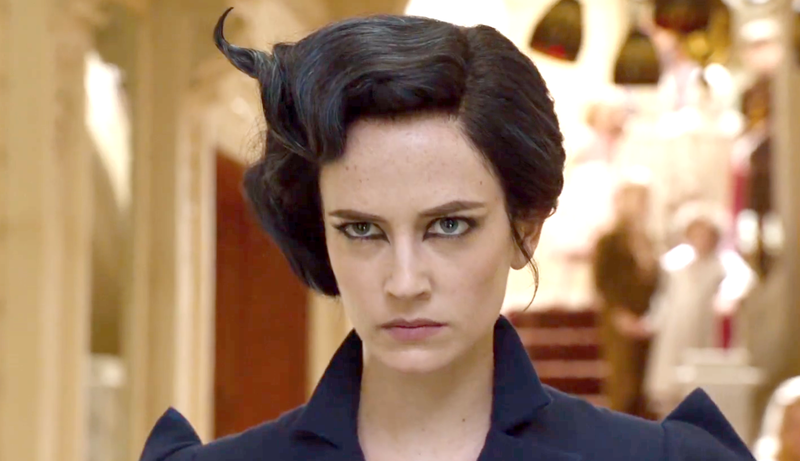 The eye’s have it…Eva Green’s perfect mascara job as Miss Peregrine. Janney, as the cream/pastel clad, flat-voiced and immobile psychiatrist is superb, but the film belongs to the seductive Green, utilising the lightest of lilting South African accents and has a blast chewing and spitting out the nonsensical dialogue with ease and most of all humour. She’s the only cast member who seems to be in on and seriously enjoying the joke. Perhaps he should keep making movies; I’d never want to deprive the world of the rapturous images he can still give us. Perhaps the problem is I have grown up, hang on too tightly to the increasingly few and far between childhood memories I have (like the impact Burton’s earlier work had on me) and become a little bit too serious. But fair’s fair Tim, I’ll watch your movies and love them again, if you can bring things down a level and tighten up the spooky-slack. See the official website for the trailer. Director: Tim Burton. 127mins. Twentieth Century Fox/Chernin/Scope/St. Petersburg Clearwater/Tim Burton. (12a). Producers: Peter Chernin, Jenno Topping. Music: Michael Higham, Matthew Margeson. Eva Green, Asa Butterfield, Samuel J. Jackson, Judi Dench, Rupert Everett, Allison Janney, Chris O’Dowd, Terence Stamp, Ella Purnell, Finlay Macmillan, Lauren McCrostie.